And here is what I did with it. My first thought was to grab the Extra Large Fancy Flower punch, but then I realized this new DSP is full of big flowers!!! I chose the more muted colors in the set! Colors here are Pear Pizzaz, Baja Breeze & Chocolate Chip. Pear Pizzaz is a new In Color (that will be around for 2 years!!). Baja Breeze is a returning In Color. 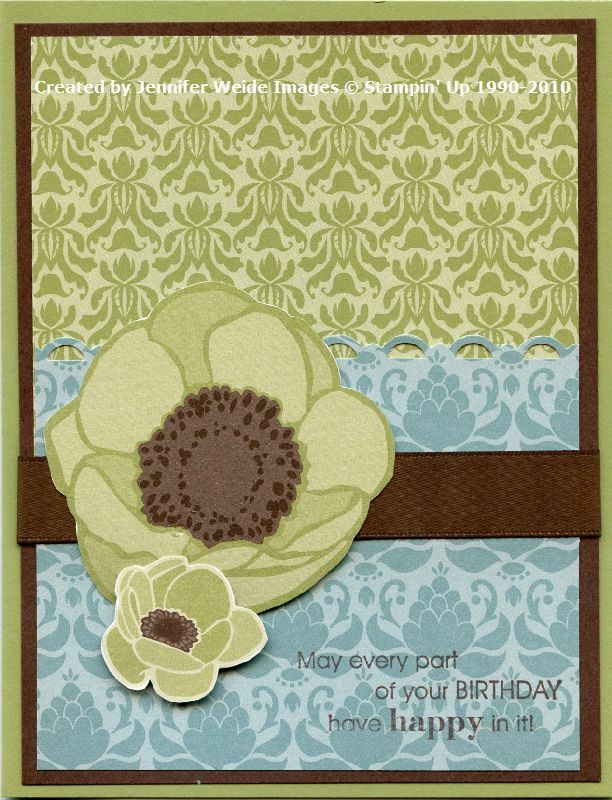 Card base is Pear Pizzaz with a background layer of Chocolate Chip and then half layers of printed DSP in Pear Pizzaz & Baja Breeze. The top edge of the Baja was edged with the Scallop Trim border punch which has made its return in the new catalog (YEAH!!). The flowers were cut from the DSP page and attached with dimensionals. A Chocolate Chip satin ribbon is layered around the Baha, under the flower. The saying is from the Full of Life set. Pretty simple really. Hope you are all having a good weekend! Rained out here from baseball so getting bonus time at home. Made some more progress on sorting out my stamp room today, now need to go work up a swap card and make 20+! Thanks for stopping by! Gorgeous use of the new paper! A stunning creation! Love the way you cut out the flowers from that gorgeous dsp...beautiful card! You did a great job ! Great card ! Love this card - what a great way to use that dsp! So pretty! This is just smashing!!! You did a fabulous job. Thanks for sharing this beauty with all of us. You've really shown how versatile this paper is!!! Gorgeous card! !